Pros: Stunning optics, high quality materials (including eco-friendly lead- and arsenic-free glass) and contemporary design combine to put this Japanese binocular up there with the best of the European competition. 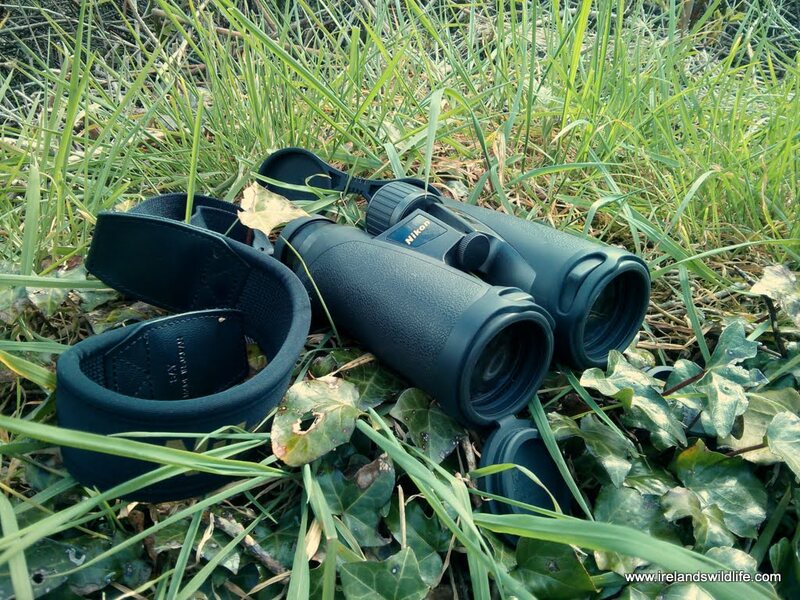 Bright, clear, razor sharp image practically to the edge of the field of view, coupled with excellent balance and handling makes the EDG a superb binocular in the field. A real pleasure to use. 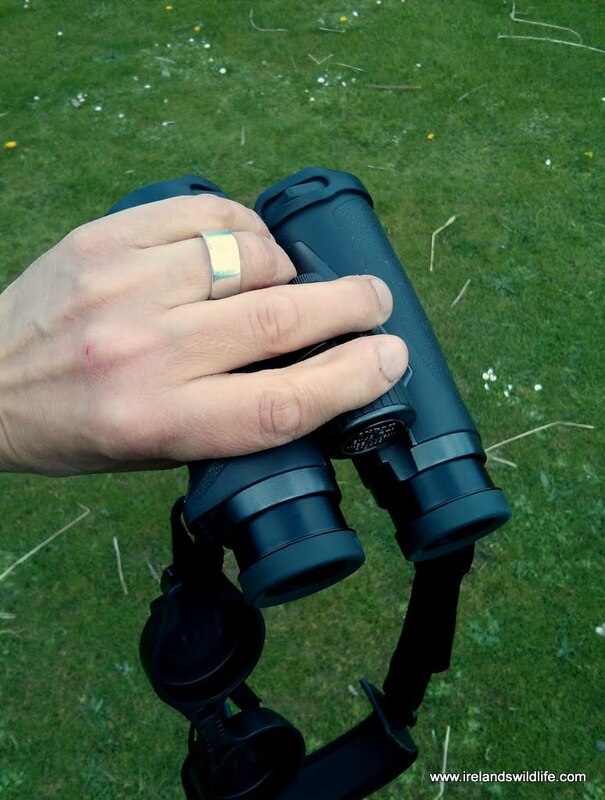 Cons: It’s hard to find any functional flaws in a binocular of this calibre… but there are a few niggles. While many reviewers cite Nikon’s super smooth focus mechanism as a plus point (and there’s no question that it IS silky smooth), to be honest I found it a bit “spongy”. The close focus isn’t as close as it might be either, at around 2.5 metres. It’s adequate, some competitors easily focus to under 2m. Although the EDGs perform very well in low light, they are perhaps a shade darker at twilight than I was expecting, given their optical pedigree and high-end prisms and coatings. With the EDG Nikon has created a pair of premium binoculars that are up there with the very best in the dizzying heights of the optics stratosphere. The price, of course, reflects that, but if you’re looking to invest in the very best, then the EDG from Nikon should certainly be on your premium binocular short list. View the Nikon EDG on the Nikon UK & Ireland website. When I knew Nikon was sending the EDG in for review I was genuinely excited. I’d heard great things about this flagship model from the Japanese optics heavyweight, and couldn’t wait to put them through their paces. The binoculars arrived in a classy black box with the EDG branding emblazoned on it in gold lettering. Nestled in the matt black cardboard of the box interior was a swanky-looking case containing the binocular itself, and the usual assortment of accessories including a rain guard, padded neck strap, cleaning cloth tethered objective covers… and an added extra you don’t normally see: some flared rubber eye-cup attachments to block out stray light. It’s always a nice touch when you find something unexpected in the box. When you pick up the EDGs they feel like a premium binocular. They are solid, and a comfortable weight: not so light that you’d question the quality of the materials or build, but not too heavy to carry and hold comfortably for long periods either. They are covered in a tactile black rubber armour that is tough, but yielding and textured enough to offer a secure and comfortable grip. It also feels substantial enough to protect the binoculars from knocks. The Nikon’s are a great fit in the hand thanks to the single hinge design and exposed barrels. The Nikon EDG handles beautifully. 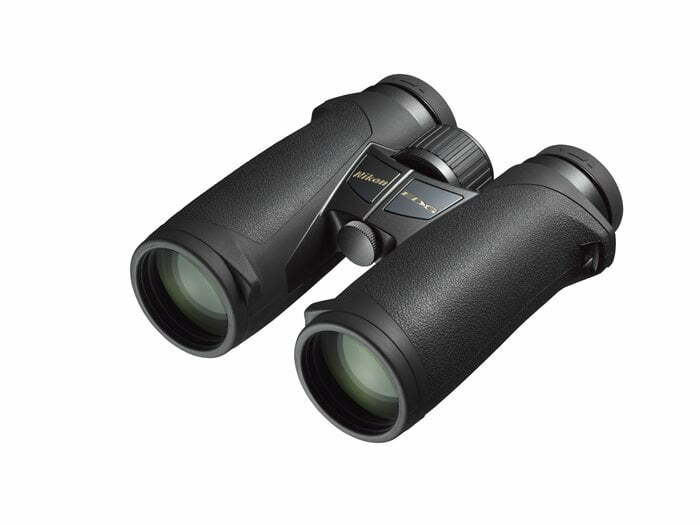 At 785g they’re around average weight for binoculars in their category… but they are superbly balanced, so that you hardly notice the weight at all when you’re using them. You need a bit of weight in a binocular anyway: binoculars that are too light are, curiously, more difficult to hold steady than well balanced binoculars with optimal “ballast”. Light weight can also equate to cheap, sub-standard components in the optical system — so be wary of “lightweight” binoculars. The rubber armouring works well — it is tactile and yields just enough under your grip to be comfortable and secure. It also provides protection from knocks — although to be honest the EDGs feel solid enough to take a few knocks and come out unscathed — and help protect from unwanted noise (few things will send wary wildlife diving for cover more quickly than the chink of a wedding ring off bare metal). In common with several contemporary designs (the Swarovski SLC HD and the Vortex Razor HD, for example), the Nikon EDG employs a single hinge high on the barrels, giving the binoculars a “H” profile. To my mind this is the optimal binocular design — it facilitates a superb wrap around grip on the barrels with no lower hinge to get in the way. It’s simple, elegant and effective… and it looks good. Hats off to Nikon… the EDGs certainly looks the part. The twist up rubber-coated eyecups provide a maximum quoted eye relief of 19.3 mm — making them a long-eye-relief binocular, which means they should work very well for people who wear eye glasses. The Nikons also offer more capacity for eye relief adjustement than you generally see, with three “click stops” between the fully up and fully down position, so setting the optimum eye relief for you should be straightforward. Typically if you’re using the binoculars without glasses you’d use the eyecups in the fully-up position. I did have an issue a couple of times with the eye cups moving when I was traversing difficult terrain — but generally it wasn’t a problem. The body itself is made from magnesium alloy, which is light, but very strong. Naturally the Nikons are sealed and purged with nitrogen, so the optical system is completely waterproof, dust proof and immune to internal fogging. The Nikon EDG is, quite simply, optically superb. It renders a pin sharp image with excellent colour fidelity, contrast and sublime detail from the centre of the wide 7.7° field of view right out to the edge — with very minimal softening only apparent right at the edge. It offers a “walk in and look around view” that is consistently impressive across every type of viewing condition I managed to test it in… from early morning directional sunlight, to squally April showers, to hazy overcast days. The EDG took it all in its stride and continued to deliver stunning views. The coatings and glass used in the Nikon EDG are, as you would expect, the best available on the market today. Compared to most, if not all premium sports optics companies, Nikon is a monster. It’s a huge company, and has the benefit of it’s long optical heritage to draw on, not just in sports optics, but in photography, medical devices and other high-grade optical fields. It’s scale means it has all of the resources it needs to manage every aspect of optics production in house, from R&D through design, right through to production of the finished product at its own state-of-the-art manufacturing facilities. The quality and attention to detail evident in the EDG reflects that. ED (Extra-low Dispersion) glass in the objective lenses compensate for chromatic aberrations, and provide images with better contrast and resolution, while a field flattener system works to minimise field curvature giving sharp, clear images all the way to the edge of the field. The use of advanced dielectric multi-layer coatings on the prisms provide consistently high light transmission across the visible spectrum, resulting in bright, vibrant images with remarkably natural colour. The prisms are also phase corrected to prevent phase shift and improve resolution. It all adds up to an impressive package… not just on paper, but out in the field too. There was no sign of chromatic aberration (colour fringing) during normal use. A fly-by raven sillhouetted against a backlit cloud was perhaps the ultimate test — the black bird was clearly defined with no sign of colour fringing: the EDGs even managed to reveal some feather detail at distance in this extremely high contrast situation. Impressive stuff. The detail rendered is “count the feathers” sharp. I handed the EDGs to a few people who weren’t used to using high-end binoculars and the results were consistent: a sharp intake of breath followed by a “Wow!”. Suffice it to say that to my eyes at least, the Nikon EDG is at least on a par in terms of resolution and detail with the best of the best. The one area optically where I felt that the EDGs should deliver more… given their spec and their price point… was low light performance. They perform superbly in mediocre light, but in fading twilight, when things get really murky, the image through the EDGs seemed darker to my eyes than the view through the similarly specced Vortex Razor HD and Swarovski SLC HD I had around to compare them with. The strange thing about that is that both of the other binoculars sported a 10×42 configuration, with a correspondingly smaller exit pupil, so on paper you’d expect the 8×42 EDG to blow them away in terms of low light performance. They didn’t! Size comparison (from left to right): Vortex Razor HD, Nikon EDG, Swarovski SLC HD and the Vanguard Endeavour ED. The focus wheel on the EDG is large, wide and in the ideal place for your focusing finger of choice. It’s also consistently smooth as it turns through its 1 1/4 turns from close focus to infinity. Nikon has earned a reputation for its buttery focusing mechanism, but to be honest I wasn’t so taken with it. 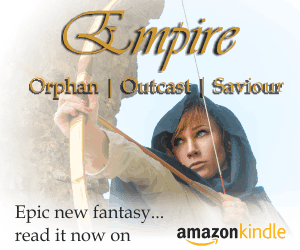 To me it felt a little spongy and imprecise. I never had an issue achieving pin-sharp focus with the Nikons… but there was a slight feeling of disconnect between rotating the focus wheel and the focusing of the image. It’s hard to explain properly — but if you try a pair you’ll know what I mean (or perhaps it won’t be an issue for you). You get used to it, of course… but it was a little disconcerting. The quoted close focus of the EDG is a relatively pedestrian 3m. In practice I managed to focus the binocular a little closer than that… but it was still a fair way short of the best of the competition. For most wildlife viewing and birding situations it’s not going to be an issue, but it could leave you struggling if you’re watching insects (dragonflies and butterflies, for example) or want a close up view of a delicate wildflower just the other side of the fence. Many of the EDG’s contemporaries comfortably focus to within 2m, and I was expecting better from the Nikon’s here. The EDGs come in a fancy case that has obviously been custom designed exclusively for the EDG range. It looks good, and is functional as far as cases go — but I suspect most people who buy the EDG won’t really use the case much. Binoculars of this calibre are built to be used… and cases tend to get in the way. So, if you’re anything like me the case will probably live in the back of a cupboard or drawer somewhere until you need to put your venerable binoculars into storage — at which point you’re unlikely to be worried about the case. Much more important are the accessories you’ll actually use. The padded neck strap is perhaps the most important of these… it is wide, with sufficient padding to comfortably carry the binoculars for long periods. There are handy quick-adjust buckles that let you easily shorten or lengthen the strap to suit, and the strap in general is unobtrusive and functional. The EDG branded rain guard is pretty standard fare, and attaches to one side of the strap to protect the eyepieces from rain and dust when you’re not viewing. The tethered objective lens covers also work as expected, attaching to the barrels. They are removable, so you can put them away with the case if you find they get in the way (they are good for protecting the objective lenses, but anything dangling around the front of the binoculars can be a real pain in windy conditions — flapping into the field of view, and worse… introducing “shake”). An interesting touch is the inclusion of “winged” eyecup attachments to block stray light from the side. It’s always great to get something unexpected… but while I enjoyed testing them, they soon went back in the box. They do cut out light from the side, which in some conditions can be a bit distracting, but I preferred using the binoculars without them, and they stop you using the rain guard… which in Ireland is a really useful tool. 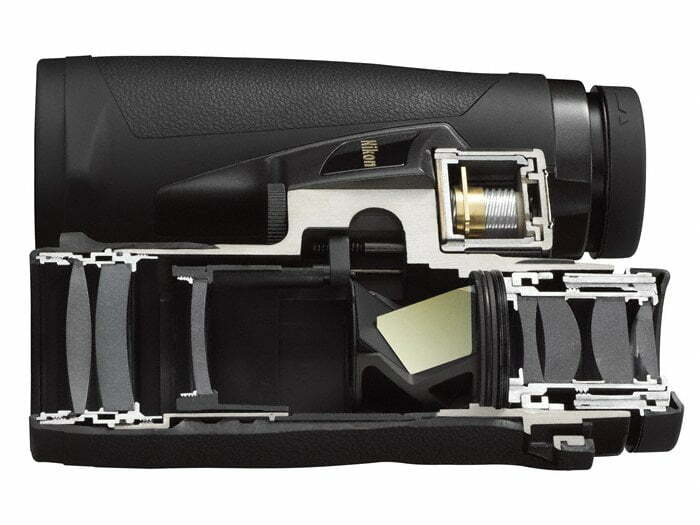 The Nikon EDG comes with Nikon’s 10 Year Warranty covering defects in material and workmanship. Nikon has done an outstanding job with the EDG — it is a superb binocular. There really is very little to fault — optically its as good as anything out there, it’s exceptionally well made and is comfortable to carry and use. Bar a few personal foibles there’s not much more to add. Yes, they are expensive… but the best binoculars always are. Unlike, say, consumer electronics, which become dated practically overnight, binoculars age gracefully. You measure the useful life of a good pair of binoculars in decades, not a few years. If you use them every day — or even just a few times a week — then, measured over the lifetime of the product, even the most expensive binoculars work out costing just pennies per week. If you’re shopping for the best birding and wildlife optics money can buy, then you’ll need to make room on your shortlist for the Nikon EDG — it’s a real contender. I’d like to thank the PR Office at Nikon UK and Ireland for submitting the EDG 8×42 for review on the Ireland’s Wildlife website. If you’re an optics or gear manufacturer and would like to submit your wildlife related product for review on the site please get in touch using the contact form and we can take things from there.